Right now, as you read these words, there’s a galactic gold rush brewing that will make 1840s California look like a rehearsal dinner. At this very moment, a handful of billionaire-backed companies are planning to mine outer space for ungodly reserves of precious metals and other untapped treasures. On the moon alone, quadrillions of dollars of interplanetary paydirt are at stake. This isn’t just a high-flying, hopelessly optimistic plan, either. Things are already in motion. The rockets are built and the FAA has already given certain companies the all-go for launch. The cosmic golden nuggets are ripe for the picking and fortune, as the saying goes, favors the bold. Whether we like it or not, some of the wealthiest venture capitalists on Earth will soon launch mining operations on the Moon — and if we ever hope to become a multi-planetary species, that isn’t necessarily a bad thing. The treasures these space-age prospectors seek are myriad. The lunar surface is brimming with not only precious metals and rare isotopes, but also a litany of other natural resources. Some of these are ridiculously valuable. Helium-3, for example, currently has a projected value of $40,000 per ounce. To put that in perspective, gold is currently being traded at about $1,200 an ounce. This incredibly high valuation comes from the isotope’s relative scarcity here on earth, as well as its potential as a fuel source. Helium-3 could be used as an efficient, alternative fuel source in fusion reactors, and about 220 pounds of it could theoretically power Dallas for an entire year. Not all the Moon’s treasures are quite so exotic, however. In addition to rare isotopes and precious metals, there’s also cold, hard cash for the taking. Google has set aside $30 million in prize money for its Lunar X Prize Competition, in an effort to challenge privately funded engineers and entrepreneurs to develop lost-cost methods of space exploration. In other words, whoever gets to the moon first not only gets unfettered access to its resources, but also millions of dollars just for arriving first. Google also offers individual prizes for completing certain milestones — including a Water Detection Bonus Prize. As it turns out, water may be the most valuable resource not only on the moon, but also in the solar system. Once frozen water has been located, the hydrogen and oxygen can easily be separated — and if you have hydrogen and oxygen, you have rocket fuel. Just imagine how much money the first lunar gas station could charge per gallon! To top it all off, even the moon’s dirt (known as regolith) is highly valuable. Due to the high per-pound cost of sending materials into orbit, anyone hoping to set up a mining operation on the moon will need to “live off the land” as much as possible. With this in mind, a team at Virginia Tech has already used simulated regolith to create bricks that could be used for lunar construction projects. Similarly, the European Space Agency has developed a synthetic regolith that, when mixed with magnesium oxide, yields a material with 3D printing potential. Why ship a moon base brick-by-brick when you could just as easily print it — or better yet, sell the bricks to a lunar construction company? Believe it or not, there are already a handful of private space companies racing each other toward the launchpad. In late 2016, Moon Express — arguably the world’s foremost lunar mining company — received approval to launch a moon mission. This marks the first time the government has approved a private mission beyond Earth orbit. “We go to the moon not because it is easy, but because it is profitable,” jokes Naveen Jain, co-founder and chairman of Moon Express, invoking John F. Kennedy’s famous Rice University moon speech. That isn’t just a clever quip, though. 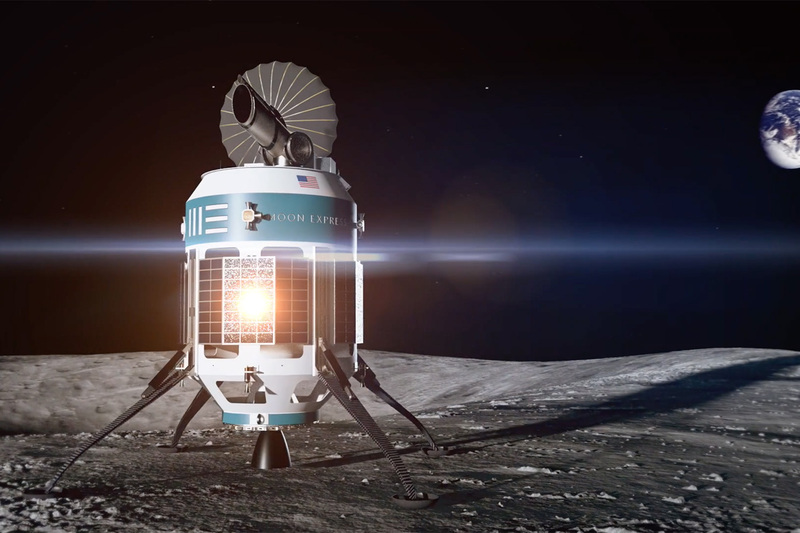 Moon Express has already raked in one million dollars in X Prize money for being the first private company in the competition to present and test a lunar lander vehicle. The company could cash in on other X Prizes as early as November of this year; that’s when the company hopes to land on the moon. To compete for the $20 million first-place prize, all a privately funded company needs to do is successfully place a spacecraft on the moon, travel 500 meters across the lunar surface, while transmitting high-definition images and video back to Earth. Easy enough, right? Thing is, Moon Express isn’t the only outfit in town. It’s currently in a race against a handful of other space mining companies — the most notable of which are Deep Space Industries (DSI) from Mountain View, California, and Planetary Resources from Redmond, Washington. While not explicitly focused on the moon, both companies are carving out their own slice of the burgeoning space mining market by developing technologies to survey and extract resources from Near Earth Asteroids (NEAs). Due to their proximity to Earth, many water-rich NEAs are much easier to access than the moon. For this reason, Planetary Resources has dubbed these bodies as the “low hanging fruit of the solar system” and is developing a space telescope platform to analyze NEAs to determine their makeup. This data will then be used to pinpoint which prospects to mine for raw materials (namely water and Platinum Group Metals). The company plans to launch its asteroid prospecting system in 2020. Similarly, DSI Will use its Prospector-1 spacecraft to rendezvous with a NEA to determine its composition and subsequent value. The company hopes to eventually use a fleet of “harvesters” to the latch onto resource-rich asteroids and extract water. After processing, thrusters will supposedly be able to use this water as a propellant to tow the asteroid back to near-Earth space where these assets can then be processed. The company is set to launch its prototype Prospector-X spacecraft later this year. It used to be that laying claim to space rocks was tricky business, but thanks to some forward-thinking legislation enacted in recent years, many of the legal hurdles standing in the way of these space mining operations have been ironed out. Up until recently, there weren’t many ratified international laws or treaties regarding resources found outside of our planet. In 1967, we got the Outer Space Treaty, which establishes broad parameters about the use of space for peaceful purposes, and also specifically states that no country can own anything outside of Earth. Obviously, this agreement isn’t exactly ideal for anybody looking to set up a moon mining operation. But the game changed two years ago. In 2015, the Obama administration pushed forward the Commercial Space Launch Competitiveness Act. 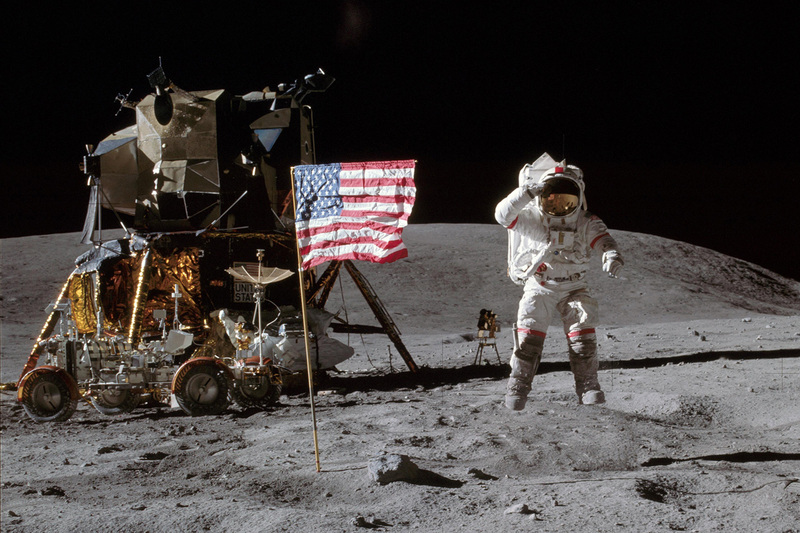 This legislation essentially works around the semantics of existing treaties, and enables individuals to recover resources in space without outright claiming sovereignty over the lunar land that the resources were taken from. With the legal framework in place to determine who owns the rights to any resources recovered on the moon and beyond, the doors of opportunity have been flung wide open. There’s a massive hoard of loot floating over our heads, and whoever gets there first basically has carte blanche to mine it — we just have to make the trip. It might seem like all this space mining business is still multiple decades away from coming to fruition, but Ian A. Christensen, a Project Manager with the Secure World foundation, believes this new era is closer than you might think. As futuristic as it may seem, the technology is already in development. NASA has partnered with machinery giant Caterpillar Inc. as part of the Innovative Partnerships Program. The joint collaboration looks to develop “regolith moving operations” such as trenching, strip-mining, boring, and excavating. NASA’s Resource Prospector mission — which could be launched as soon as the early 2020s — will utilize a rover to search for subsurface lunar resources. Once a deposit has been located, the vehicle will deploy a drill to extract materials up to one meter deep. A single meter might not sound like much, but on the moon, many of the most valuable materials don’t require massive excavation projects to obtain. Due to millions of years of impacts, the surface of the moon itself is covered in rich deposits. At the beginning of the California gold rush, gravel beds were so concentrated with gold, the early forty-niners could pan by hand for these resources in streams without heavy extraction methods. The uncolonized moon will likely be similar, which is precisely why Jain dislikes using the term “mining” as it pertains to the lunar surface. Not too long ago, sending something into space cost a lot of money. In fact, it still does. But that cost is rapidly decreasing, thanks in large part to innovation and competition amongst private-sector launch providers like SpaceX, United Launch Alliance, and Orbital ATK. Right now, it costs roughly $10,000 per pound to launch something into orbit. SpaceX hopes to bring that down to $1,000 in the next few years. He’s not exaggerating. Moon Express is working with companies on the bleeding edge of space travel. The company currently has a contract with a company called Rocket Lab, and plans to use the company’s Electron rocket system for its inaugural moon mission. The Electron utilizes Rocket Lab’s revolutionary Rutherford engine for both stages of propulsion. The body is created out of carbon composite, greatly reducing overall weight. The engine itself is made almost entirely out of 3D printed components. Normally it takes months to build a rocket engine from scratch, but Rocket Lab can build its engine in just three days. As soon as one of Earth’s intrepid space prospectors sets up the first outpost on the moon, the floodgates will open up. After one group builds the lunar infrastructure necessary to support a mining operation, it will also pave the way for other companies to follow suit. Moon Express has its sights set on much more than mining the moon’s untapped resources, The company’s endgame is to set the foundation for a lunar supply chain. As such, Naveen Jain sees himself as less of moon marauding space pirate and more of a space-age Steve Jobs. From harvesting rare-earth elements, to building moon motels made of regolith, to building a lunar gas station; the moon is ripe with economic potential. This is more than a space-age cash grab, though; it’s a necessary step for humanity if we ever hope to become a multi-planetary species. Oddly enough, handing over the keys to the universe to literal corporate golddiggers — as off-putting as it may be — might just be the most viable and economical step toward establishing humanity’s first extraterrestrial colony.